Kawasaki has been one of the most cutting edge names in the jet ski industry since they began manufacturing personal watercraft in 1973. 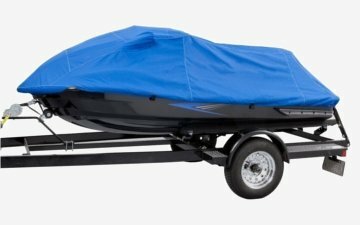 Protect your Kawasaki jet ski with a cover from Boat Covers Direct! We have jet ski covers from multiple manufacturers to choose from: Carver, Covercraft and Westland. Looking for a custom fit? Covercraft offers custom covers for many Kawasaki models such as their Ultra, ZXi, STX and SX-R models. These custom fit jet ski covers are not only patterned to fit your craft perfectly, but they feature a quick access gas tank panel along with a sewn in mesh bag which allows you to conveniently store your goggles, gloves, and other items. Westland's PWC covers are also going to be made custom for your particular model Kawasaki, and they offer these covers for many different models such as the SS, Sport and X2. This cover features a heavy duty shock cord sewn into its hem for a tight fit, and the loops which are sewn into the hem of the cover are designed to allow you to secure the cover with straps (not included). Carver Industries PWC covers are patterned based off the size of your watercraft. While they are applied to specific models, you can also choose your PWC cover by size. Carvers covers are all entirely Made in the USA from USA obtained materials. In addition to being Made in America, they also feature sewn in tie down loops which can be used to secure the cover with the six tie down straps that are included free with the cover. No matter which of our manufacturer's you choose, you cannot go wrong. Covering your jet ski is one of the single biggest things you can do to keep it in nice condition and preserve its value. CoversDirect® guarantees the fit of all of the covers our manufacturers apply, and we also guarantee the quality. Contact us directly with any questions about your purchase- we would love to help you cover your PWC!